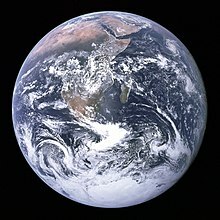 Ilẹ̀-ayé (earth) tabi aye tabi ílẹ́ ọ̀gẹ́rẹ́ tabi ilé-ayé je plánẹ́tì keta bere lati oorun, o si je eyi ti o tobi julo ninu awon planeti ti won ni ile ti o se te. Ile-aye je planeti akoko ti o ni omi to n san ni odeoju re, be sini ile-aye nikan ni planeti ti a mo ni agbala-aye (universe) ti o ni ohun elemi. Aye ni papa gberingberin to je pe lapapo mo oju-oorun (atmosphere) to je kiki nitrogen ati oxygen n da abo bo ile-aye lowo atangbona (radiation) to lewu si emi. Bakanna oju-oorun ko gba awon yanrin-oorun laaye lati jabo si ile-aye nipa sisun won nina ki won o to le jabo s'ile-aye. ↑ 2.0 2.1 aphelion = a × (1 + e); perihelion = a × (1 - e), where a is the semi-major axis and e is the eccentricity. Àṣìṣe ìtọ́kasí: <ref> tag with name "blue planet" defined in <references> is not used in prior text. Àṣìṣe ìtọ́kasí: <ref> tag with name "Terra" defined in <references> is not used in prior text. Àṣìṣe ìtọ́kasí: <ref> tag with name "sidereal_solar" defined in <references> is not used in prior text. Àṣìṣe ìtọ́kasí: <ref> tag with name "water vapor" defined in <references> is not used in prior text. ↑ 1.0 1.1 Standish, E. Myles; Williams, James C. "Orbital Ephemerides of the Sun, Moon, and Planets" (PDF). International Astronomical Union Commission 4: (Ephemerides). Retrieved 2010-04-03. CS1 maint: Multiple names: authors list (link) See table 8.10.2. Calculation based upon 1 AU = 149,597,870,700(3) m.
↑ 3.00 3.01 3.02 3.03 3.04 3.05 3.06 3.07 3.08 3.09 3.10 Williams, David R. (2004-09-01). "Earth Fact Sheet". NASA. Retrieved 2010-08-09. ↑ Allen, Clabon Walter; Cox, Arthur N. (2000). Allen's Astrophysical Quantities. Springer. p. 294. ISBN 0387987460. http://books.google.com/?id=w8PK2XFLLH8C&pg=PA294. ↑ Cazenave, Anny (1995). "Geoid, Topography and Distribution of Landforms". In Ahrens, Thomas J (PDF). Global earth physics a handbook of physical constants. Washington, DC: American Geophysical Union. ISBN 0-87590-851-9. Archived from the original on 2006-10-16. http://web.archive.org/web/20061016024803/http://www.agu.org/reference/gephys/5_cazenave.pdf. Retrieved 2008-08-03. ↑ 8.0 8.1 Rosenberg, Matt. "What is the circumference of the earth?". About.com. Retrieved 2010-04-22. Àtunṣe ojúewé yi gbẹ̀yìn wáyé ni ọjọ́ 8 Oṣù Kọkànlá 2018, ni ago 23:14.